Human service professionals deal with a wide range of problems, from child abuse, parenting issues, and elderly care, to addictions, mental illness, sexual assault, unemployment, and criminality. These must be constructed as problems for professionals to appropriately respond to them. Human service provision starts from there. But in the everyday experience of service providers and users alike, there is a parallel world of ordinary troubles that remains professionally undefined but real, even when troubles are turned into problems. 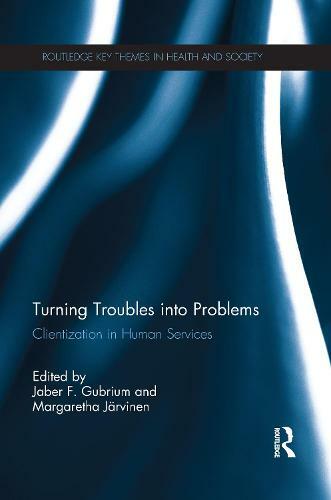 This book brings into view the relationship between these worlds as it bears on the process of clientization-the transformation of people and troubles into clients and problems. Rather than taking the process for granted as many critics do, the book examines the instability of the process on several fronts and highlights its surprising local complexity. Foregrounding everyday life, the leading idea is that the transformation of troubles into problems is not straightforward and that problems are continually subject to alternative understandings. This poses new what, how, and where questions. What are ordinary troubles and how do they relate to the construction, maintenance, or undoing of serviceable problems? Where is social policy and how does that figure in the front-line work of service provision? The questions point to the challenges of clientization at the discretionary border of troubles and problems in everyday service relationships. With chapters written by an international group of human service researchers, this book is an important contribution to the literature dealing with the construction of personal problems and will be useful to students and academics in sociology, human services, social work and policy, criminal justice, and health care.